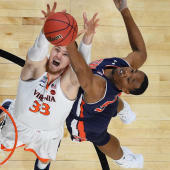 With Virginia's 85-77 victory over Texas Tech in the NCAA Tournament championship game, the 2018-19 college basketball season was completed. So now it's time to look ahead to the 2019-20 season. And, if these projections prove correct, some familiar faces could be back in the Final Four because I really do think Michigan State and Virginia should be good enough to make back-to-back Final Fours. They're No. 1 and No. 2 in the Top 25 And 1. And before you scream "but it's too early to rank teams for next season because we aren't even sure who's coming and going," understand that I did this exact exercise on the night of the 2018 title game, and 14 of the 16 schools that ultimately made the Sweet 16 of the 2019 NCAA Tournament were in my initial Top 25 And 1. So, at least last year, these rankings were a nice preview of the season to come. As always, I've communicated with industry sources in an attempt to make educated-guesses about which players will ultimately enter, and remain in, the 2019 NBA Draft. But, to be clear, I do not expect every educated-guess to be correct because there are surprises every year. So each time somebody makes a decision that runs counter to what's projected here, I'll update and adjust these rankings accordingly. That's a promise. And another thing worth noting is that I assigned every uncommitted top-100 prospect to the school most likely to enroll him, according to 247Sports' Crystal Ball projections. So that's why Cole Anthony is on North Carolina's roster, why Matthew Hurt is on Duke's roster, why Trendon Watford is on Memphis' roster, so on and so forth.